With such beautiful interior, I couldn’t help but visit Craftsmen Specialty Coffee soon after it opened. Siglap has been one known area for eateries and hangout but has been in lack of cafes. Only just recently that several has started to enter this territory. This place serves only coffee, cakes and pastries, so it makes a good after-meal hangout. Recently the “Industrial” look has been one of the most popular choice of interior for cafes, and for Craftsmen, it is no exception. With a simple mix of metal and wood, and beautiful warm lighting to finish it off, the cafe has pulled off the look pretty well. I really loved the choice of furniture and lamps which are aesthetically pleasing. Afternoon sunlight pouring into the cafe to create picturesque shadows. I personally love sitting by the window which makes the perfect spot for crowd gazing. Of course I had to get my favourite choice of coffee – Cafe Latte. The coffee here is thicker in its body which I really like, and it ends off with a roasty taste. On its own, the taste is balanced but on the sweeter side. Had a taste of their Butter Croissant, which was really fragrant and tasty. However, it was a little too dense and I would have liked it more if it was fluffy and moist. It is hard to find a really good croissant around, most of the time they are either too dry or tasteless. Later on, my friend and I shared a Salty Caramel Danish. Maybe I am not a fan of such pastries, so I though it was pretty average, but it was a good match with the coffee. I ordered a second coffee, Cappucino, to see if it tastes very different. It tasted slightly stronger than the Latte and had a longer-lasting after taste. 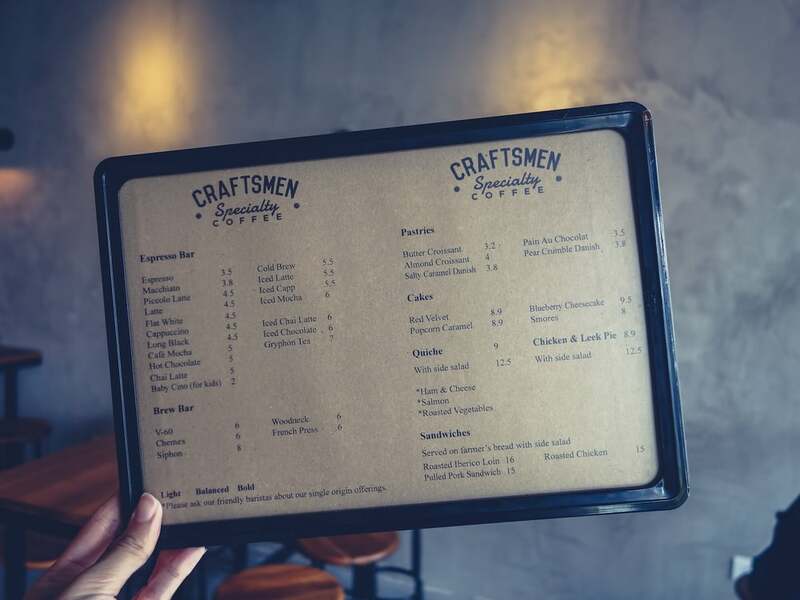 I had a really good time at Craftsmen because of its pleasant interior and comforting ambience. The coffee left me with no regrets and I would definitely come back here to nurse a coffee craving. It is no surprise their coffee is good - their coffee partner is Dutch Colony, which roasts their own beans at Pasar Bella. Craftsmen would be one of the best options for a coffee break in the east, an alternative to Penny University if the latter is too crowded.